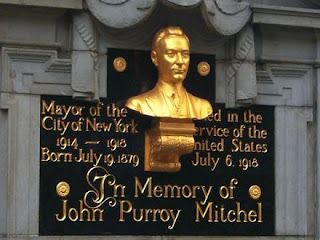 Among the long list of monuments in Manhattan dedicated to persons no one has ever heard of, the John Purroy Mitchel Monument must rank near the top. The monument is part of the Engineers' Gate to Central Park, a striking neo-classical stone wall and sweeping staircase that leads to the Reservoir above. 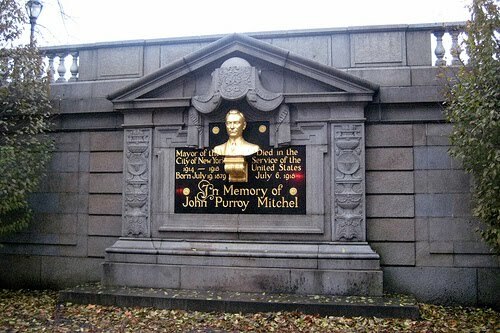 Central to the wall, designed by Thomas Hastings and Don Barber, is the memorial featuring a gilded bust of Mitchel. 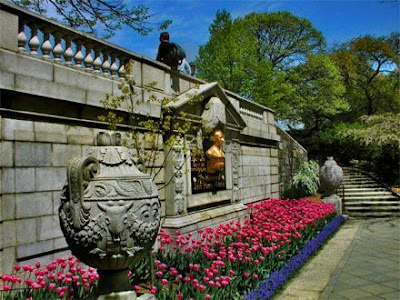 It is one of the most unusual and impressive of the Central Park memorials. Mitchel remains the youngest elected mayor of New York City, coming to office at the age of 35 in 1913. He was graduated from New York Law School in 1901 and immediately started making a name for himself. Determined to break up the Tammany Hall corruption, his investigations ended the careers of John F. Ahern, Manhattan Borough President, and Louis Haffren, Bronx Borough President, in 1906. Recognized nation-wide as a reformer, he was elected Mayor in 1913. With his appointment of Police Commissioner Arthur Wood, Mitchel took steps to clean up the corrupt New York Police Department, longtime time bedfellows with the Tammany gang. Tammany Hall wouldn't go down without a fight, though. John Mitchel strongly believed in vocational schools for the underprivileged to help them become employable. Tammany used his intended educational reforms in a wide-spread smear campaign; insisting that Mitchel was making it impossible for poor children to receive a free, liberal arts education. Mitchel lost his re-election bid in 1917 and immediately joined the Air Service to fight in World War I. He never got that chance, however. On July 6, 1918 while flying a training flight in his single-seater scout airplane at Gerstner Field in Louisiana he fell 500 feet to his death. John Purroy Mitchel had failed to fasten his safety belt. The New York Times reported the following day "One of the mechanicians had said a few days ago: 'It makes my hair stand on end to see Major Mitchel fly. He takes risks and seems to think nothing of it.'" Mitchel's wife accompanied his body, alone, back to New York for his funeral and burial. Mitchel Field in Long Island was named after him, now the site of Hofstra University and the Nassau Coliseum. The Mitchel Memorial Committee retained Hastings and Barber to design the gate and commissioned sculptor Adolph Alexander Weinman to execute Mitchel's bust. It was unveiled in 1926. Today the memorial to the great reformer who forgot to fasten his seat belt creates an impressive entry to the park. And nobody knows who he was.